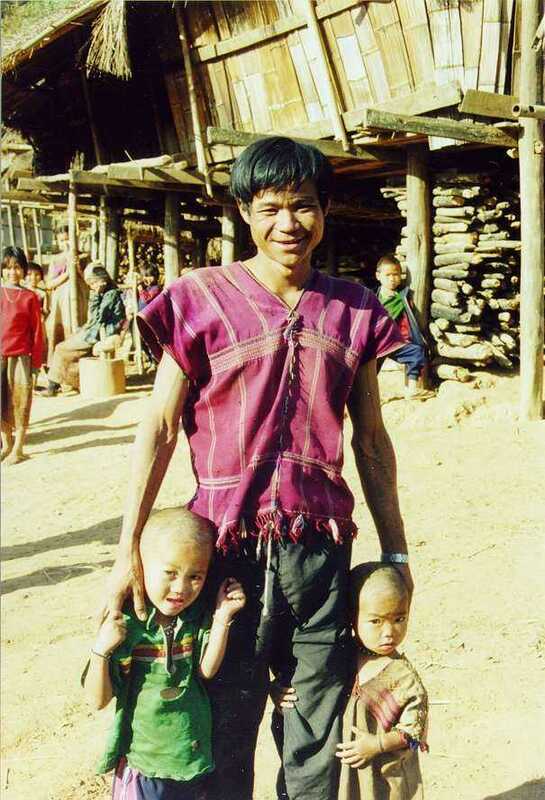 After being sent to Thailand about ten years ago for work, I finally returned to this fascinating country for a holiday. 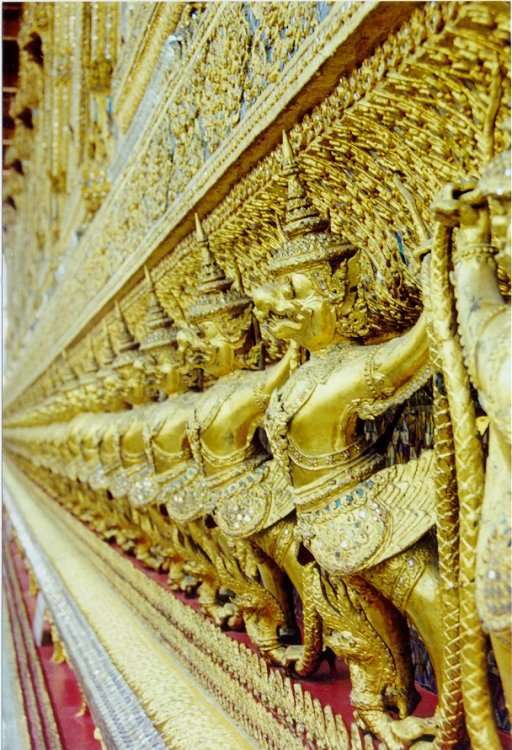 I had three weeks in which to see and enjoy as much of Thailand as I could. Of course, there is no way I could see all that this country has to offer -- but I did my best! One of the world's most amazing cities. Huge, noisome, swarming with people, lots of tourists, fearsome traffic, ancient history, and bursting with sheer, enthusiastic, life. 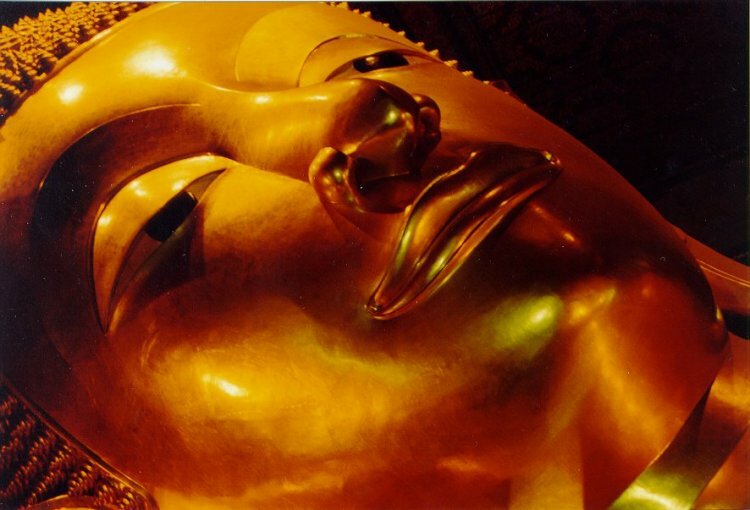 Full-size picture (61 kB) The face of the reclining Buddha at Wat Pho (Wat Phra Chetuphon) in Bangkok. Buddha is always shown with a slightly inscrutable smile, as though he knows something you don't. Maybe he does. He's the Buddha, after all. Full-size picture (70 kB) Demon figures on the walls of Wat Phra Kaew (Wat Phra Si Ratana Satsadaram), home of the Emerald Buddha. Apparently these creatures support the earth. 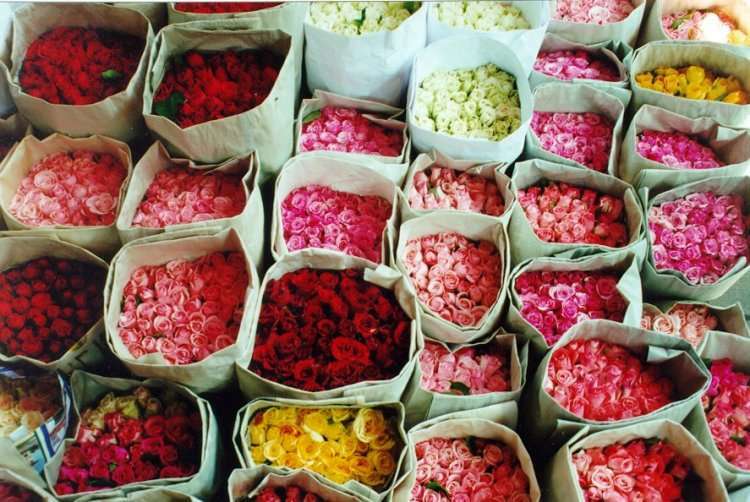 Full-size picture (67 kB) Bundles of flowers at the Pak Klong flower market in Bangkok. I had trouble explaining to the taxi driver that I wanted "Pak Klong" (the flower market), not "Pat Phong" (the world's most famous red-light district). 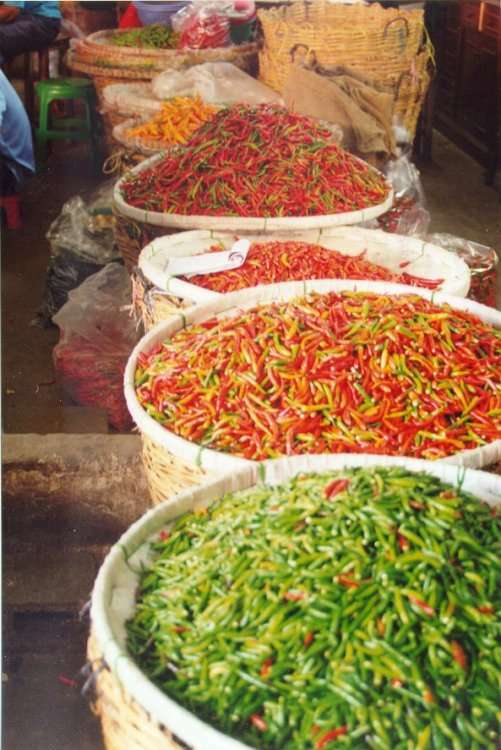 Full-size picture (56 kB) Baskets of chillies at Pak Klong in Bangkok. Full-size picture (56 kB) Khao San Road, in the Banglampu district of Bangkok. 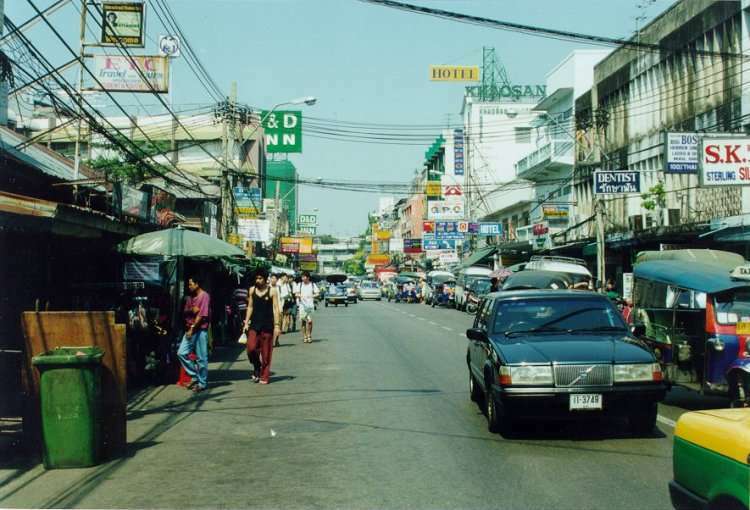 This is the main backpacker area of Bangkok, and the street is filled with hostels, bars, shops, and street stalls. You can have anything you like tattooed, braided, beaded, and pierced here. 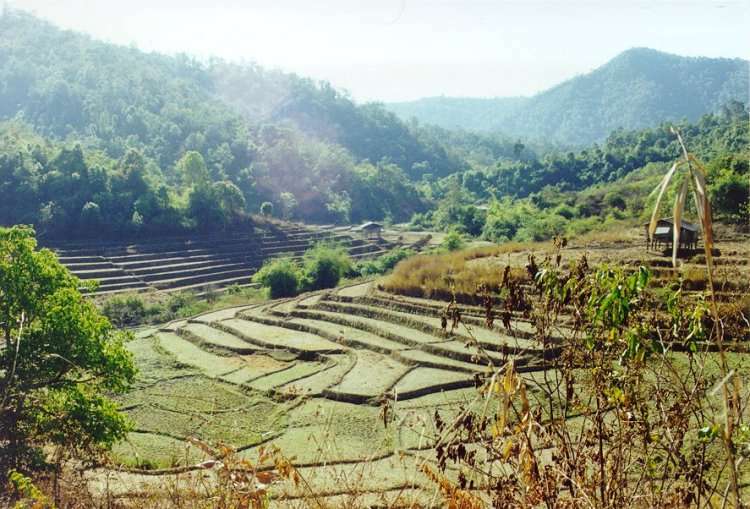 When I arrived in Thailand I joined an organised trek, conducted by Intrepid Travel. 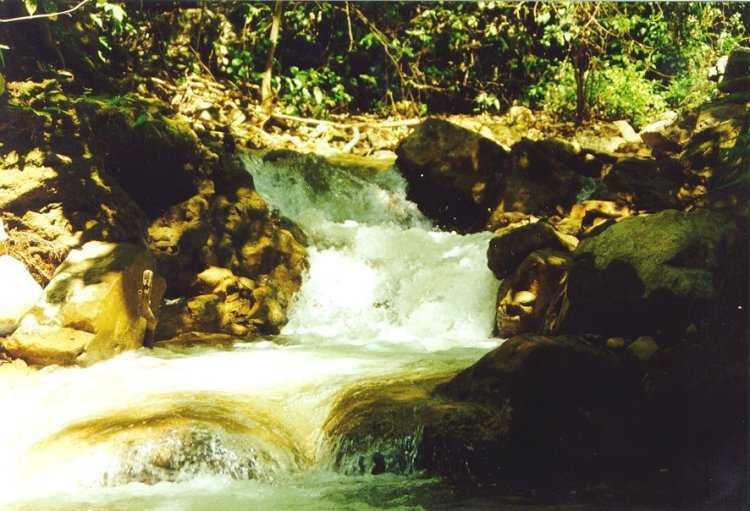 Their Taste of Adventure trek is only eight days, but packs in a lot of experiences! Because I had limited time this was a great way to quickly get into holiday mode. Hello to Bruce and Diane, Hiro, Janice, Lili, Marilyn and Michael, Nick, Nicola, Tammy, and Yves. Full-size picture (53 kB) We travelled by overnight train from Bangkok to Chiang Mai. 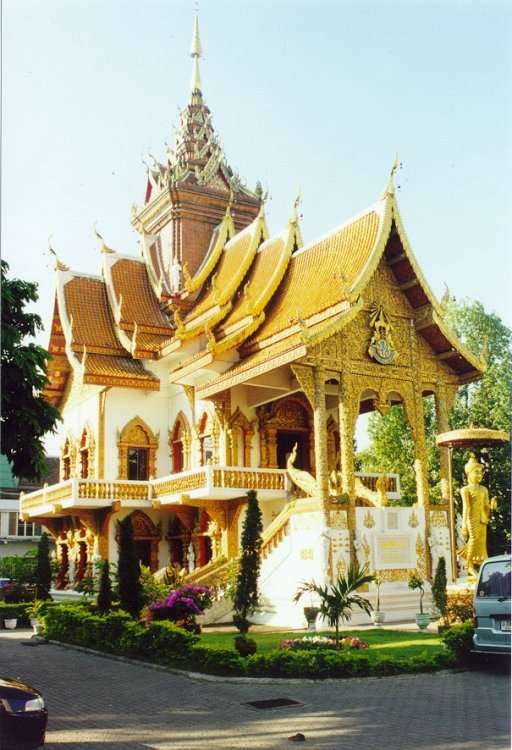 This is Wat Buppharam (Wat Meng), a fairytale, "wedding cake" temple not far from our hostel. Full-size picture (67 kB) Rice paddies outside the homestay village, as we hiked out on the morning of the first day. 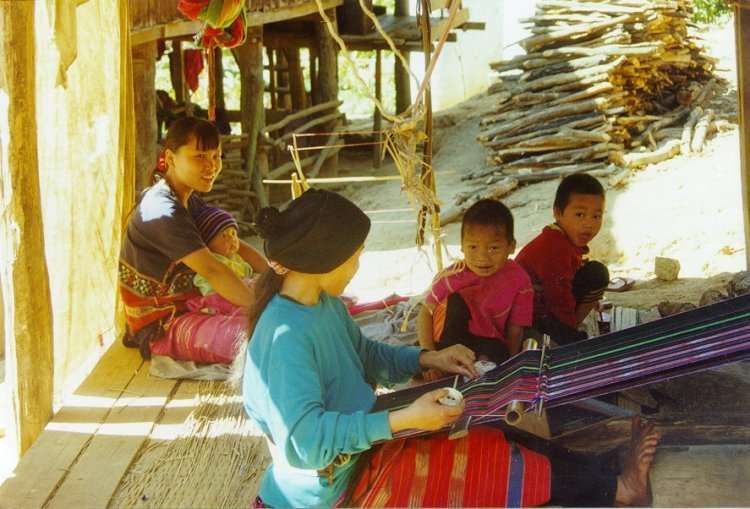 Full-size picture (54 kB) Karen village people weaving as we passed through their village on the first day of the trek. 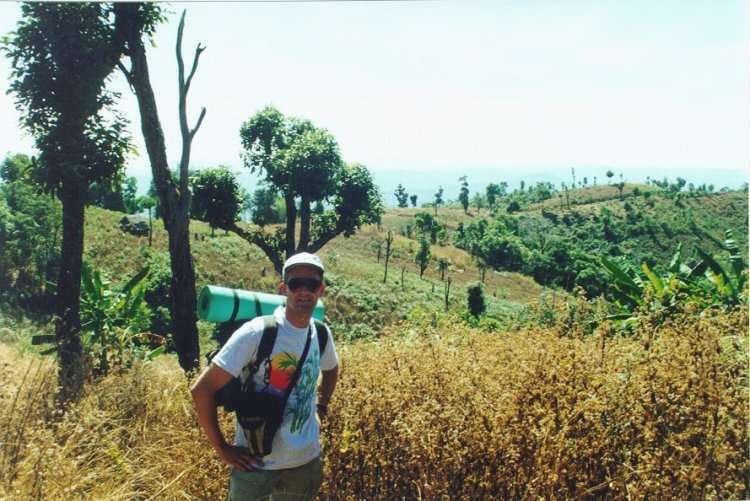 Full-size picture (61 kB) Myself, trekking through the hills of northern Thailand. 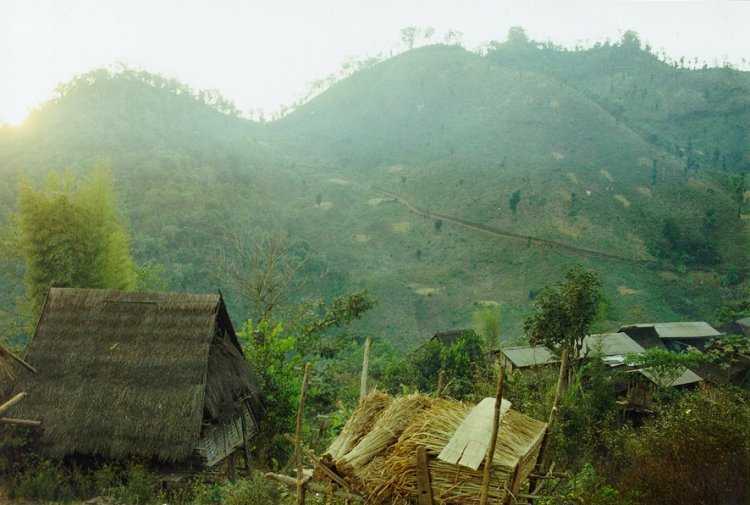 Full-size picture (36 kB) Sunrise over the hill tribe village where we slept on the first night of the trek. The air was as fresh, clean, and crisp as any I've known. 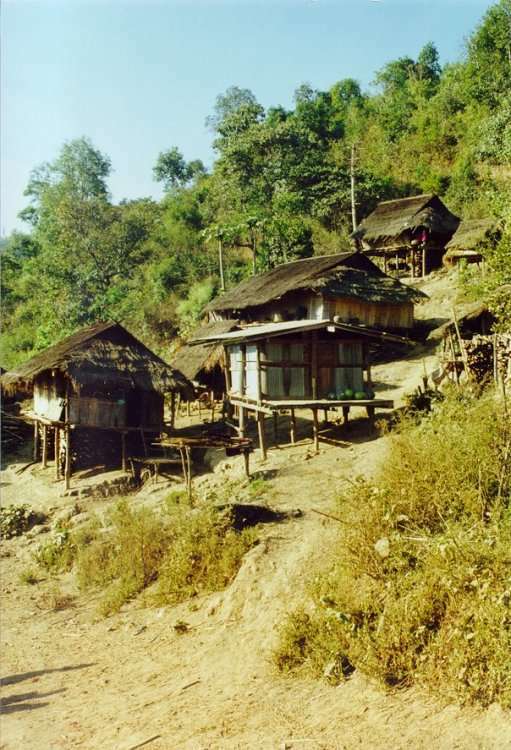 Full-size picture (68 kB) Huts on the hillside of the village where we slept on the first night of the trek. Full-size picture (51 kB) On the second day of the trek we spent hours wading up this river. Sometimes we clambered from rock to rock, others we were up to our thighs in rushing water. Not for the faint-hearted. Full-size picture (46 kB) After returning from the trek we had a day to relax. We had an excellent group Thai massage (the very best way to recuperate), then saw some of the sights of Chiang Mai. 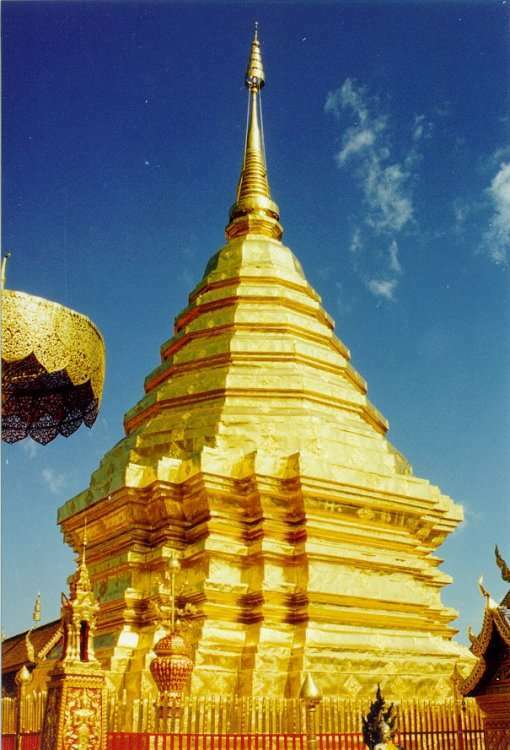 This stupa is at Wat Doi Suthep, the temple in the hills overlooking Chiang Mai. 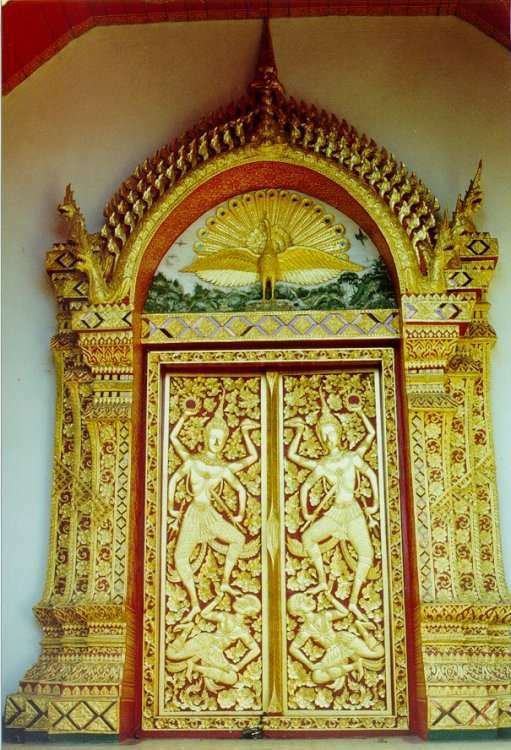 Full-size picture (69 kB) Elaborately decorated doors at Wat Doi Suthep. After the trek I travelled to the resort island of Koh Samui in the Gulf of Thailand. 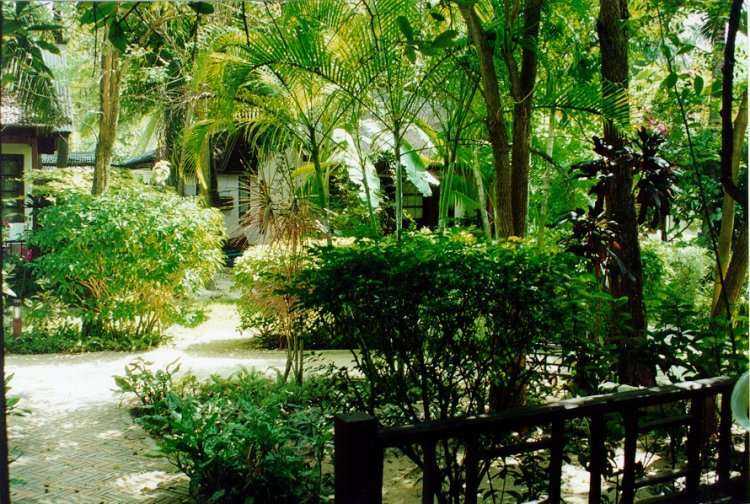 I stayed in a bungalow at Montien House on Chaweng Beach, near the shops, cafes, and bars of the shopping area. Full-size picture (78 kB) View from the porch in front of my bungalow at Montien House. Full-size picture (42 kB) Chaweng Beach, Koh Samui. This photo was taken early in the morning, before the day's crowds start to fill the beach. 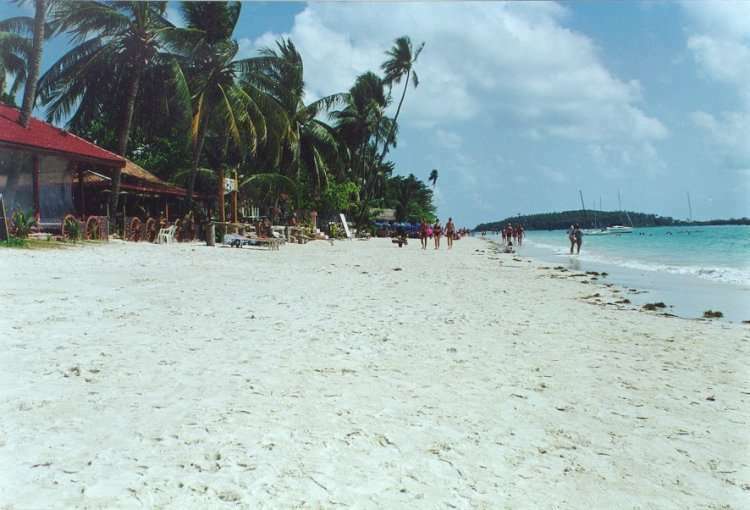 Full-size picture (56 kB) In the evenings all the resorts and restaurants set up chairs and tables on the beach. 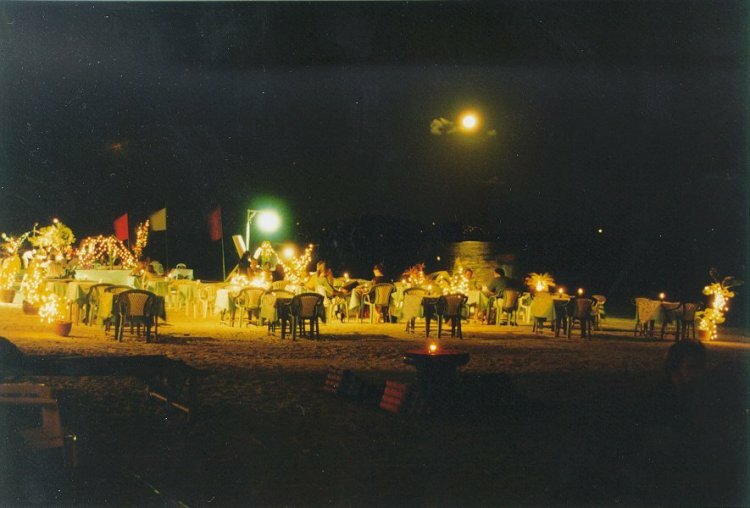 It's great to eat under the stars, while listening to the gentle rush of the surf. It's also a good time to decide which party you're going to that night. In fact there's nothing much to see on Koh Samui. Fortunately you're so busy sunbaking all day and partying all night that it's not a problem! About the only tourist attraction is the Big Buddha, but I haven't included any photographs here. One event not shown here is the "Full Moon Party" on the island of Koh Pha Ngan. This monthly event is rated as one of the top ten parties in the world! No photos, sorry. Enough to say that I had a very good time! Anyone who wants more information please contact me.